**Early Registration Special** – Book before May 1st for ONLY $50 per session! To take advantage of this discount please call the studio to set up your reservation. Please call the studio if you have additional adults or additonal children. Online booking is priced for ONLY 1 adult and 1 child. The family that paints together stays together. Bring the whole family out on Sundays and spend some quality bonding time while creating! Sunday afternoons 11-4pm take advantage of our family painting special. 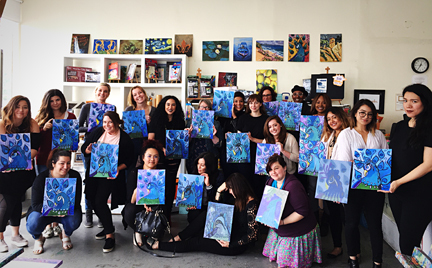 $57 lab fee plus 15% off canvas or painting surface for 4 members (max 2 adults) . This is “open lab” uninstructed painting. Sunday’s from 4-6pm we offer Family Brushes and Bites. 6 person minimum. Includes instruction and refreshments. Must call studio to reserve. PAINT:LAB has a 24 hour cancellation policy. Any cancellations with less than 24 hour notice are subject to a 40% cancellation fee. Customer forfeits entire amount if cancellation is less than 5 hrs. No show will also result in a full forfeture. All deal vouchers are subject to forfeiture with less than 24 hours notice to reschedule. The Studio does not issue refunds. Studio credit is offered for returned merchandise or canceled workshops and camps within the restrictions outlined above.